The first project I'll be attempting on this blog is a 3d printer. Printers are everywhere these days, but my interpretation will a little unusual. I've been thinking about building or buying one for a while, but haven't committed because I was satisfied with my other tools. I finally chose to build my own printer after running across a Parker MX80L linear stage on eBay. It's perfectly sized for a small 3d printer, and was so cool I just had to buy it. As you might have guessed, the unique characteristic of this printer is that it will be constructed using commercial linear stages. I went with the name LinearFDM as this will be an FDM printer actuated via linear motors. I'm not great at naming things. A linear motor is an unrolled variation of a regular motor. Now this might seem like a pretty weird idea because linear bearings and encoders cost orders of magnitude more than their rotary alternatives. A linear motor also uses a ton of magnets because the entire travel distance must be lined with magnets. Clearly the advantages of a linear motor must offset its cost or we wouldn't be using them. Think of it like this: each component between the motor and the resulting motion is an opportunity for inaccuracy. Timing belts add backlash, stretch, and cogging errors. Screws have similar drawbacks, and additionally reduce acceleration because they must be "spun up" pre-reduction. Every bearing and connection is additional mass that must be accelerated, and another opportunity for misalignment and slop. Flattening a motor so that it can directly produce linear motion allows the axis to be driven without any mechanical conversion. 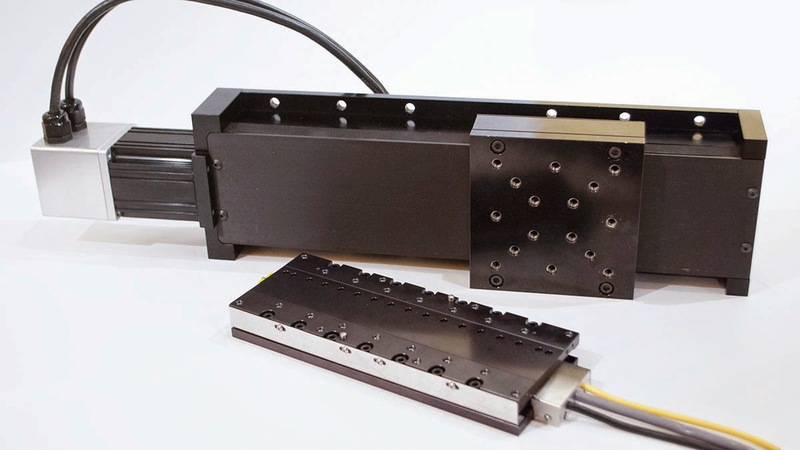 A linear motor eliminates all belts, screws, or other intermediaries, and in doing so avoids the problems they create. To understand just how incredible a linear motor really is you need to look at the numbers. You might be getting the feeling that building a 3d printer using linear motors is overkill, so I'll be honest. There is no compelling reason to use a MX80L in an FDM printer - the limitations of plastic extrusion are the weakest link by far.